If you want the short version, here it is. 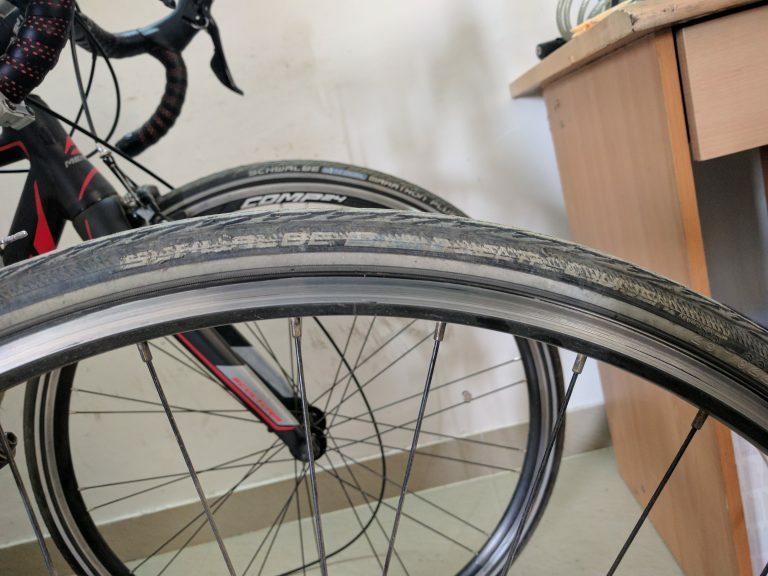 They have been on my bike for over three years and have clocked a mileage of about 15000 kms through all seasons on Bangalore roads and potholes; there has been only one puncture in my rear tube. The stock tyres were some 700x38c ones (don’t remember the brand). 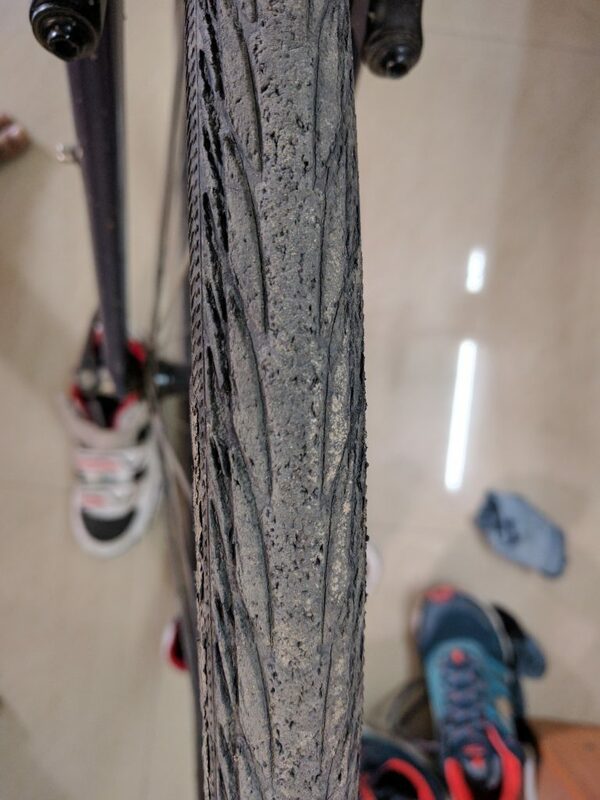 The tread had worn out within an year and half of usage, the rubber was soft and there were numerous cuts and small stone and glass fragments embedded in the soft rubber. The BOTS mechanic asked me if I rode off-road regularly, to which I replied no. He also asked if I was okay to compromise a bit of comfort for speed. He wanted to put on skinnier tyres. Back then, I was terribly unfit. I was overweight by at least 15-20 kgs and even riding my cycle from my home to BOTS store (a 16 km ride) was a huge undertaking. I shoved away the thought of discomfort and said okay. He had a pair of Delta Cruiser and a couple of Marathon Plus tyres. Back then, the Delta Cruisers were about INR 1800 each and the Marathon Pluses were somewhere at INR 2500 each. Back then, I also did not know that tyres could cost so much. The BOTS mechanic mentioned that those were the best puncture-resistant tyres. My choice was driven by economics. I paid for a pair of Delta Cruisers somewhat reluctantly. There was a hidden cost to this swap that I did not anticipate. My older tubes were too large for the skinnier tyres. I had to spend an extra 600 for a pair of skinnier tubes. It took me some time to get used to the skinnier tyres. Over the next year, I lost quite a few kilos and became skinnier myself. I started to feel comfortable on the saddle. I enjoyed the improved speed (just a relative thing; these aren’t that good in terms of rolling resistance) without worrying about flats. One evening while I was returning from my office, I realised that my rear tyre was flat. My experience of using the tyres for one and half years and not having a flat had made me a bit lazy – I had stopped carrying a pump and a patch kit. Fortunately, my home isn’t that far from the office. So, I walked and pushed my cycle instead. The culprit was a thin steel wire that had entered vertically, pierced through the tyres and had embedded itself in the rubber. I couldn’t get it out at all. The length of the wire was equal to or slightly shorter than the thickness of the tyre rubber. I used a sharp pointy needle to push it through to the other side instead. I never had another puncture in the next one and half years. 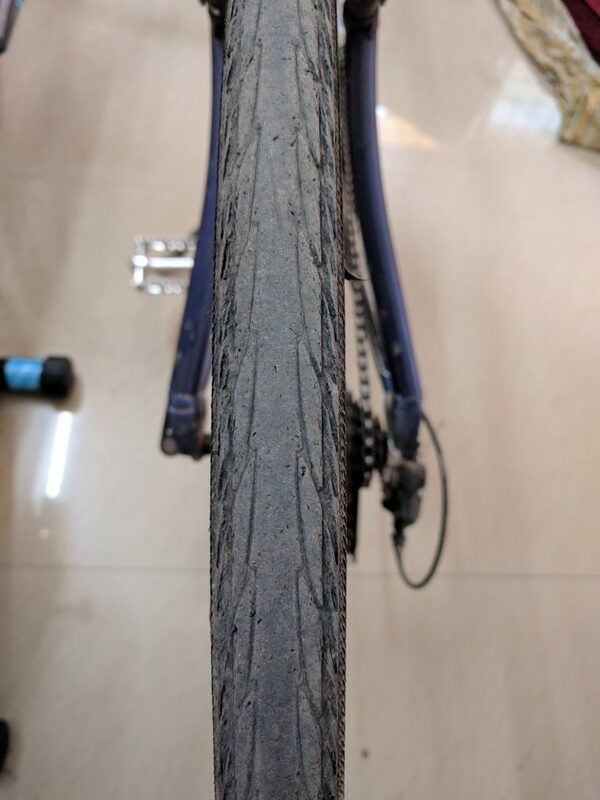 Long story short, these tyres were bombproof enough to warrant two things. Firstly, to preserve even a single case of flat tyre as a memory – the likelihood of such a thing being so less. Secondly, to fit my road bike with a pair of Marathon Pluses, for which I did not hesitate paying INR 4000 a piece (2000 km and counting). Here are a few pictures after three years of usage. The read tread. This has worn past the porous rubber (visible in the front tyres). In case you cant read the text, it says (or used to say) Schwalbe Delta Cruiser. In the background, Marathon Plus on my road bike is clearly visible.